INFRALAB Interactive Flat Display (IIFD) is all in one solution for projector and Interactive Whiteboard, on which users can write, draw, annotate and save document on screen. Besides, it also has built-in sound speaker that greatly meets users’ requirements. Now, you don’t have to worry for the maintenance of projector or the replacement of lamp. Interactive Flat Display is a smart class solution that will work for years with matchless brightness and zero maintenance. IIFD caters all your needs from sharing ideas, smooth writing & annotation, showing HD videos and running audio files in high quality. 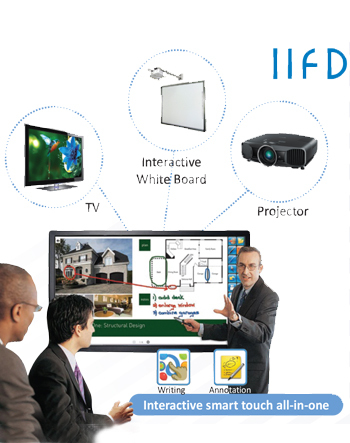 In other words, IIFD adds more functionality to your classroom in terms of collaboration, audio and visual effects. IIFD is the latest innovation in education sector. Invest in this asset for your institute to experience its unique magic for years. Get in touch with us today at smartclassroomindia@gmail.com or +91- 9541103099.